Thanks. Dont worry about it on my account. Was just curious about how it was working out. Just got my kit and noticed how sloppy the screws were in the nut blocks and am already thinking about how to improve them. I haven't even put power on it yet. Love the design of your nut blocks. Did you print them in PLA or ABS. I actually haven't used my hadron in awhile. I got a new computer and haven't gotten around to transfering the settings over. If I have time this weekend I'll post the models. It works well, but I think my Makerslide wheels are too tight on one side, so I need to do some tweaking. How are your printed nut mounts and ACME Rod working out? Those mounts look great. Have you posted the design yet? Yes I'll post them once it's complete. I printed some handwheels for the top of the screws last night (makes it much easier to adjust the gantry) but they were too weak, so I'm printing a revised model tonight. I'm considering making a new motor mount too. I have the original ones and they have quite a bit of flex in them. Printed the top mounts and installed all the parts this weekend. Took awhile to get the alignment right, and I might do a revision of the nuts. If I tighten the two M5 screws that hold the nuts to the gantry, it seems to twist them just enough so the steppers miss steps. I can either leave them slightly loose, or I'll have to figure out a way to let them flex/self align. Just need to recalibrate the firmware for the new steps/mm, relevel the gantry and bed, and do some test printed. Here's the second one printed. To speak to how well built the Hadron is, while it was printing the second mount, I left the room. I came back just as it was finishing the last 2 layers, and it had walked itself nearly off of my desk. I was amazed it hadn't fallen onto the floor, but the print was perfect! 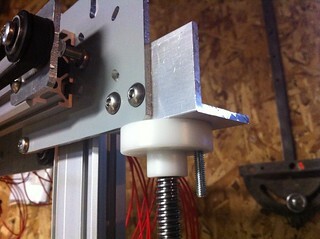 Work in progress, ACME nut mounts for the ORDbot. So if my steps/mm for my extruder is damn near perfect, why am I extruding too much plastic? I have a 0.35mm Jhead, and I followed a guide that said to set it as 0.31 in Slic3r. My issue is that on solid layers, it's extruding too much plastic, and I've had prints fail because the nozzle gets caught on the print and knocks it or the glass loose. Any tips? The qubd not working is less to me about the cost, and more the giant waste of time it's been. Waiting for it to arrive after the Kickstarter closed, then waiting for new parts to try to get it to work. I agree totally. This is exactly why I switched to the Plastruder. I couldnt get it working consistantly with PLA. It would be ok free air, but then I would go to print and it wouldn't flow consitantly, or simply get jammed. I never had a problem with my previous wades and jhead, that's why I'm switching back. I might try something different for my next printer, might build a delta printer of some sort. The qubd not working is less to me about the cost, and more the giant waste of time it's been. Waiting for it to arrive after the Kickstarter closed, then waiting for new parts to try to get it to work. If I had been using ABS it probably would have been fine, but I'm using exclusively PLA. I switched to a MakerGear Plastruder after seeing and reading all the problems people have with the QU-BD. I don't have a single regret with that decision. The plastruder is dead reliable and super effective. It just works, all the time, every time. With that said, it's damn heavy so I'm going to be trying out the Airtripper filament drive + JHead next for my 12" build. On the QU-BD, Rodney has followed all the advice posted on the wiki here and gotten them to be quite solid. The combination of new drive gear and spring loaded tensioner do seem to work. new wrench in the mix: printed a calibration cube, looked decent, changed some settings and went to print again, all of a sudden it looks like the extruder is losing steps, or something. Turns out, the qubd motor got so hot, it MELTED THE PLA drive gear so the gear was spinning on the stepper shaft. I'll be switching it out for my old extruder motor. The tensioner on my original wades reloaded cracked, so my Ordbot was out of commission. I received my qubd hot ends, and after spending a bunch of time and money getting different wheels, Barts tensioner thing, I gave up on them. I'm using the motors, thermistors, and cartridge heaters with my new Wades Reloaded and Jhead. If anyone wants the rest of the bits I'll let them go cheap, but I don't know how useful they would be. He shipped the parts from the UK for less money than some sellers wanted to ship from Washington state to BC, and his service was top notch. The quality of the Wades Reloaded is very nice, I think he printed on mylar or some sort of clear plastic, and then trims the parts out after. The plastic film is firmly attached to the prints. I'm reassembling everything and I'll recalibrate this weekend, and hopefully (finally) get some good prints out of this machine. well I was obviously out to lunch doing those calcs then. So why did I see such an improvement switching to 1/8 microstepping? I was printing last night at 195*, 0.2mm layer height, and getting great results... until my computer froze (I think due to slic3r). I'm really looking forward to the SD card and control panel that Royco is working on. Combine that with his new Azteeg X3 and my new qubd dual extruders, and the new Z axis ACME leadscrews, I'm hoping to get even better quality results. My mistake, it is 1.25 pitch. The 160 is steps/mm with single stepping. so the 160 (my original setting) in Marlin is steps/mm or steps/inch? either way, it seems to have fixed one of my major issues. M8 thread is indeed 1.25mm pitch, M6 thread is 1mm. With M8 rod, you'll get 4064 steps per inch, with M6 rod it is 5060 per inch, using full stepping. It's 1.25mm per revolution isn't it so 0.00625mm per 1.8 degrees of rotation. M8 rod is 1mm per revolution. Single step with 1.8 motors is 200 steps per revolution. This gives .005mm per revolution. So apparently one of my major issues was my own fault (insert facepalm). During initial setup and testing, I set my Z axis to full step..... and then promptly forgot to change it. With M8 threaded rod and 1.8* motors, that gives me a 160 steps/inch. 25.4mm/160=0.15875mm per step. So, it seems that every few Z axis changes when printing, it would go to the closest degree it could, which was too much or not enough, and boom, failed print. But I'm still replacing the Z screws with ACME threaded rod. I ordered 2 1/2"-10, 12" long with delrin nut and bearings for $40 shipped from an eBay seller. I also ordered some new clamping couplers, so no more set screws. Thanks for the tip on voxel - I just ordered 3 spools from them. It's great to have a Canadian supplier for ABS and PLA. Now I just have to wait until late September or early October when my Hadron kit is supposed to ship! Hopefully my extruder and electronics show up before then too. So 5 revisions later, I have a fan duct that works. I'll post some pics later. I can't get decent overhangs on large objects no matter what i do. Either they sag (too hot), or they unstick (too cold). But i'll get the hang (pun intended) of it eventually. ABS is easily sourced from Home Depot plumbing department. No need to actually melt down filament. I actually broke a part last night when trying to remove it, it was stuck so well. ABS juice is good for printing PLA too. I don't use ABS, I'm using PLA exclusively. Since using rubbing alcohol, every part has stuck, and stuck so well that when I go to pull the part off, the tape comes with it. I actually need to peel the tape off of the part. Another tip, for those of use that don't have an adjustable lower Z endstop (I broke mine trying to tap it), using a piece of tape or 2 on the stop can help dial in the zero level. I've solved ALL my problems with parts not sticking to bed with ABS juice. I never print without it, whether cold or heated bed. If you haven't done it yet, just drop some ABS into a jar and fill it with acetone, that's all. Then, before printing, spread a thin layer of the juice on the part of the bed that you will be printing and start printing. Works like magic on almost any surface. I use it on cheap white painter's tape (not blue that is more expensive) and get wonders. having better luck with prints sticking, seems that using a bit of rubbing alcohol to rub down the blue tape is helping it stick. I haven't hooked up my heated bed yet, I need a connector for the Azteeg bed temperature. I ordered some dark blue glow in the dark and black PLA from Voxel Factory in Montreal, so I'll see how that stuff prints compared to Ultimachine PLA. Its based on the adjustable z endstop by dzach, printed with Ultimachine 1.75mm PLA, 0.2mm layer height, 195 degrees (model and discussion here: viewtopic.php?f=33&t=1322&p=11646&hilit=endstop#p11646). I made a slightly modified version in Solidworks It shows a few flaws that I still need to tweak, mainly my extruder (I think it's pushing more filament through than it thinks), overhangs need to be calibrated. The "tower" sections was also a bit soft, so I think a duct for my fan will help with that. I just need to grab my tap set and a short M4, and I'll install it. It definetaly seems that the UM PLA likes being printed at a higher temperature. Weird. First thing you should do when changing anything on your extruder (filament, bolt, tightness, anything) is re-calibrate it. Get a calibration done, do another print, and then let's have a look at the results. well that old bolt is going in the garbage. As you can see, there is still some issues with infill, and the corners have a bit of globbing. It also looks very slightly warped. Temp was set to 180C. I'm reprinting now and I'll check the height. The widths were both about 20.4-20.1mm so those are pretty close. I lowered the temperature to 180 and see what that does for the print. Maybe that was a strong statement I made, Slic3r is a new software and it's getting better every day with many improvements and bug fixes, but yes, I have problems understanding how Slic3r calculates the amount of plastic to extrude. See the thread Slic3r and J-head hotends for what I mean by "faking the nozzle diameter". I've too posted there about some of my problems with Slic3r. It looks like the new version 0.8.4 fixes some of the problems I had, I'll have to check it out. Still Skeinforge gives more control over the various parameters. Despite the hundreds of parameters in Skeinforge, I managed to achieve accurate results much easier than with Slic3r. Maybe because of this great number of parameters I think I understand better what needs to change and how the changed parameter affects the print. I'm not really sure what you mean by having to fake the nozzle diameter. I think that's someone not really understanding how the slicing settings work. They've also added in 0.8.3 the ability to change your width over thickness for various layers, so it's basically the same as skeinforge. If you look at RichRaps blog, he gives a really good explanation of the settings in slic3r, and goes over some of the common misconceptions of what people think the various parameters do, and what they actually do. So, I switched to Skeinforge and, although the GUI is dreadful, I now know and can control most, if not all, of the extrusion parameters successfully. Slic3r is nice and easy to use but needs a lot more to become an accurate slicer, IMHO. It looks like you've got several things going wrong here. Measure the cube - what is the width / length of it? Does it come out close to 20mm? Also, what is the height of the cube? It looks like your Z steps per mm might be off by quite a bit. It also looks like you're not getting nearly enough extrusion out of your hot end. Have you calibrated your extruder to make sure that you are extruding what you think you are? There's so much blank space in your cube that it looks like something could be seriously off there. When you do free air extrusions, is the extrusion continuous, or does it stutter? You've also got quite a bit of blobbing in there, which means that you're most likely extruding at too high a temperature, although I've seen it happen at too low a temperature as well. Here is the original on the left, and the newly printed calibration box using the settings from that link on the right. 0.30mm nozzle setting with 0.2 layer height. Is the issue cooling? I've got a spare 40mm fan I can hook up, not sure if that would help? Yes, my own ineptitude. Or, I like to call it "engineering on the fly". When I was building the Hadron, I couldn't find a proper measurement for belt length, and I cut the belt too short. I wanted to use the damn thing, so I drilled a hole in the extrusion for clearance of a button head cap screw, and mounted the idler as you see. I was waiting on my Inventables order to arrive, as I ordered 10 feet of belt. It's actually not a big deal yet, it simply limits my Y travel to around 175mm, which won't be a problem until I start trying to print larger objects. Just noticed this.... your Y-axis idler is mounted inboard from the end, and with a funky screw arrangement, not the way the design laid it out. I know what you mean by adjusting the z axis. Luckily I already had a couple printers so could easily make my own adjustable block. PM me with a mailing address and I can send you one. I've got RAMPS on my Quantum ORD, but I have an Azteeg X1 I intend to put on my oversized ORD bot. I'm also already in on the QU-BD campaign. I'm not sure where they will go just yet, probably on the ORDs. I'm hoping the new settings and the Lava hot bed will help. My two biggest problems all along have been aligning the two sides of the Z axis, and setting my Z zero. Without being able to print an adjustable Z zero block, it's quite difficult to get it set just right, and it also makes leveling the bed that much harder. I'll post some pictures later, but I'm making a temporary Z zero block and a Z axis height jig to hopefully solve the problem. I'll be switching to ACME threaded rod for the Z as well in the near future. This is with pretty much default Slic3r settings, and I'm using 1.75mm PLA. The box was printed onto blue tape. I think my nozzle settings are wrong though. I ordered a 0.35mm J head, and thought I recieved a 0.50mm, but when I do a free air extrusion, the diameter is around 0.48-0.51, which seems more in the range of a 0.35mm nozzle. The box about was printed with Slic3r set for a 0.5mm nozzle. I finished building my Hadron a few days ago, now I am working my way through getting the thing moving. The Azteeg X1 is fantastic, it makes everything really easy to wire up. I'm in the midst of setting up the Z axis and extruder, so far the X and Y are working well, and boy does this thing move!